On our CELTA courses up to now, we have maintained an approach to finding out what our trainees thought about their teaching that is fairly typical of such courses: we ask them to write a self-evaluation after they have taught, which they submit to us before we sit down with them to discuss the lesson. This has several purposes and virtues: the trainee has an opportunity to reflect on the experience and work it through on their own terms; this in turn allows us the chance to see what the trainee is thinking (and, possibly, what they aren’t yet thinking about); it provides documentary evidence of the trainee’s capacity for self-reflection which is then amenable to evaluation. Earlier, we provided a fairly typical pro-forma document which contained questions for the trainees to respond to. There were questions like how far do you think you met your aims? Did anything in the lesson surprise you? If you were to teach this lesson again, is there anything you would change? What would you like your tutor’s opinion about regarding this lesson? Over time, we started to feel this was not giving us the kind of information we wanted. Quite apart from the odd case where we got single-word responses of the yes…no…nothing…not really variety, I started to feel that form-filling was not by its very nature conducive to reflection. So someone had the idea of just asking trainees to write their tutor a letter after the lesson. We started to get (I think) much more interesting and considered responses. Trainees were more candid, but also more discursive. They asked questions. They cracked jokes. Sometimes they cried for help. Of course, this had got through using the pro-forma, but we felt letters allowed for more of it. A recent visiting assessor confirmed this feeling, adding that he felt the letter approach allowed for a much clearer view of the trainee’s reflective capacity and it revealed more of their personality into the bargain. It’s always a relief to hear that something you are doing (or, in this case, asking someone else to do) is actually working. So you might be surprised now to hear that on our next course, we are ditching the letter writing idea. Then again, if you have been following discussions on this blog, you’ll already be aware that journal-keeping had caught my interest. So finally we have gotten round to breaking the old routine once more. I’ve bought a stockpile of really old-school exercise books (just like you probably had at school) and we are going to ask the trainees to keep a journal. Instead of just writing something expressly for reflection on days they taught about their own lessons, we want them to write for at least 15 minutes each evening about anything related to their experience on the course up to that point. It’s likely that on days they taught, this will predominate their reflections, but we will also hopefully get insights into their approach to planning, what they are noticing through observation and what they are picking up and toying with from our group sessions. The idea of using journals is nothing new – it is fairly common on in-service courses like DELTA and I believe it is also common on Trinity College London CertTESOL courses. But it is new to us, so we hope to learn something from it. We tutors are also planning to keep journals ourselves and make them available to our trainees, just as we will have access to theirs. Fair’s fair, after all. So what I would like to know from anyone reading this is: what are your experiences with journal-keeping, especially in a pre-service context? Do you have any useful reading references on the subject? This sounds like a great idea Anthony. I just posted comments from my student’s diaries. The experience of reading through them and hearing from the people who really matter in this process, the students, has been far more valuable than my own blogging, ranting and cries for help on my own blog. Any chance of sharing your trainee’s thoughts? Thanks for being so quick off the mark, Adam! I just saw you have posted some learner diaries and am very interested in seeing what they have to say. I don’t know if they’ll let me share anything they write, but we’ll see. Then again, perhaps they could just start a blog? Wonder if that would help or hinder their other work? ESOL colleagues at Kirklees College in Yorkshire who run a CELTA course have done this with their trainees and it looks like it’s been quite beneficial. Some of the trainees have introduced themselves and I don’t think they’ve even started the course yet! Anthony, this is Excellent Stuff. Can’t offer anything from a pre-service perspective, except that keeping journals isn’t something we did on my PGCE. I have, however, started to keep a journal about my lessons and what did/didn’t go well following Dale’s recent posts on using a journal – just informally and for myself, but probably good to get into the mindset as I’ll be starting the DELTA in January (bricking it!). Perhaps I should also take the approach you’re going with and write about anything that comes up in my day to do with teaching/language/linguistics/pedagogy/general interest and not just about how a lesson went. I may try to do this more. Thumbs up again for a fascinating post. I’ve been getting into student journals for a while and decided to incorporate them into my DELTA EA but as online blogs/journals/learner diaries? This was part of a BL Business course I used to teach. 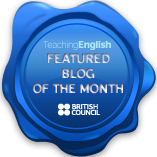 I took the idea from other teachers in S America who had students set up blogs for international exchanges. I also did it because my students were studying IT and so had no books just laptops. Basically, I posted links, readings, videos etc onto our uni VLP and they then built up their own blogs with what I had selected and their own research. They also did lesson/week reflections and practised language/topics on their own and each others. The best thing was that I could read, comment and assess them all quite quickly. One thing I did read about what on forcing students to write with the result being ‘just for the sake of it’ writing with no use. Generally I didn’t find much on the topic (perhaps my reliance on online sources) so maybe we can look forward to some more articles? ?Nudge nudge? As for an article, we’ll see, eh? I kept a teaching diary on the run up to my delta in order to get a grip on what I was doing. I wrote down simple pros and cons about the lesson. The most enligtening thing was that after a few weeks I’d look back and I’d notice that the same cons would be cropping up again and again. They were mostly things that I wasn’t particulary aware of in my teaching yet, and after one lesson I wouldn’t think they were particularly significant. But seeing them crop up in every lesson really helped to crystallise them as ‘action points’ (do you have action points on celta?). Writing this makes me think I should start it up again. I wonder what stops people doing it regularly anyway. There was an interesting article in the most recent ELTJ about a systemic lack of action research among teachers. Good idea to give celta candidates the experience of doing it and really hammer home the value of continuing it when they start teaching. I imagine for most people it simply feels like ‘extra admin’! It’s made me think about the blog I’m writing. Honestly, I’m not particularly reflective in that because I tend to write about things that went well. I think this is because starting out with Dogme I felt like I needed lots of guidance about ‘how to do it’, indeed most people I talked to about Dogme would ask things along the lines of “I get it, but I don’t know how it’d work in practice, in the lesson itself” and so I hope that the blog will help give people tangible ideas to try out in their lessons. But this thread has made me think that it might be of more use to me personally to be more reflective and critical of lessons that didn’t go so well, rather than just focus on the pros. Gone off on a bit of a tangent there but such is the power of reflective journals! Hi Anthony – we’re starting our next CELTA soon (as you know) and I’ve mailed Beth about this idea. I really like it – so it may be part of our course too !! It’ll be interesting to try out, that’s for sure. I’ve been very up front that this is a bit of an experiment, so we’ll see how they feel about it! I am excited about writing these journals, Anthony. And the same as you, I am almost more interested to see what I write than what they do. I think it’s a great idea because I know that it’s something that has helped me in the past (during my Delta, mainly). As Oli says above, starting the trainees off by getting them reflecting and becoming someone who critically looks back at the lessons learnt from both teaching and observing will surely set them off on the right path. Thanks for instigating this idea, and here’s to a good month of journalling! I’m too tired to look properly at the moment, but there seems (from a quick search I just did) to be lots of stuff in the journal “The Teacher Educator.” I have access to it if you don’t. Will share tomorrow! Please do share – don’t have access to that one, I think! I loved writing these letters for you guys – and lenghthy as they were, I presume that they already had journal like character. I am reading a lot about making learners keep journals on their learning progress in my DaF (German as a Foreign Language) studies. So I’d really be interested in how it works for you. What comes to mind, though: the format invites lengths. Thank you so much for stopping by, Claudia! Believe me, I enjoyed reading your letters (both yours and all of your colleagues’) as much as you seemed to have enjoyed writing them. Their success in revealing your thinking, concerns, questions and victories was a major contributor to my thinking we should expand the scope of this work: no matter how great your letters were, they were often more focused on the events of one lesson. I’m hoping we can capture that same spirit but help our current people write that experience large on the course as a whole (or rather, make that experience which I am sure each of you went through more amenable to observation by us). As for length, you are right, which is one reason why we suggested the 15 minute time limit (I managed 3 exercise book sides of text in that time, which I think is long but OK to read for an impression). Time will tell! One question I have is when do you think is the best time to write. Should it be straight after like a lesson evaluation or later that evening after you’ve had some time to think and analyse. All us commuters are probably used to writing/planning on the train but maybe doing it the next morning may add a new insight or 2. I really don’t know, but we have asked the journals to be available to us each morning, so the teachers can write their thoughts either in the evening or in the morning before we get started on the working day. Whether this works out as feasible remains to be seen, but, again, I hope that the 15 minute frame will allow for flexibility in when it gets done. Nowt to stop people continuing trains of thought or adding to them later, either – unlike with the “one-shot TP bound self-evaluation”, which may be another advantage? First let me say that the re-visioning of the CELTA you and your colleague are doing is fascinating, and perhaps forever altering the shape of CELTA courses– if nothing else it, it inspires other trainers to re-think the philosophy of their timetable and their views on the nature of language learning. A fundamental skill requisite to enable trainees to ‘react’ to students–what Lewis refers to as ‘response-ability’– is the awareness of and ability to record emergent language. This is the training that you refer to somewhere –your conference presentation, perhaps– namely that of getting ss to simply listen to each other and make notes of the language that arises from the conversation. I think it would be interesting to brainstorm ideas related to this: how can we train teachers to respond to emergent language, to good usage, interesting language/lexis, useful patterns, errors? What other strategies do you employ? Are there other posts/ideas on this topic? Would it be an area worthy of going into more in-depth? Thanks again for this forum and I admire your dedication to and passion for teaching and learning. Hi Derek, Thank you for your very kind words. I’m excited by the positive response to our ideas that many tutors out there are having and it’s always great to get feedback like this combined with food for thought. I will be happy to blog in a bit more depth about helping trainees to focus on emergent language – it’s this aspect of the work that I am still trying to really crack with our trainees (unsurprisingly). I’ve just been reading the replies to your post. I would like to confirm that I have found it very interesting and useful, filling in a journal each day for my CELTA. I have been writing lots of information in my journal that I feel I would never have written if you had given me a form. The journal felt like a listening ear that I could complain to if I needed to. I personally think it’s great. Mr Assessor did wonder if journaling encouraged you all to focus more on the emotional journey than the professional one: what would you say? Well I did put some emotion in mine but I wonder if that is equaly important to personal development I personally found it useful. I guess that maybe the question you need to ask is ‘what is the outcome?’ Did you find out ‘the kind of information’ (A, Gaughan, 2011) you were hoping to find out from us students? Heh heh! Quite right – working to results from desired outcomes would make sense, wouldn’t it? Marking your lessons from the classroom assignments today, I suspect that this last point paid off: all your assignments were substantial and well argued, even under class control conditions/time pressure. I’d certainly like to continue with journals, but perhaps engage a bit more in discussing the art of journalling. The trick will be doing this openly and not unwittingly skewing how people write to jump through new hoops in place of old!